Plant part used: The oil is extracted from the leaves of the plant and the essential oil is virtually colourless. Extraction: The manuka essential oil is extracted by steam distillation. Aroma: Manuka oil has a sweet and gentle aroma. The manuka plant is an evergreen shrub that reaches 8 metres in height with highly aromatic dark green and spiky leaves that bears pink and white small flowers. The essential oil is usually produced from wild plants found in Australia. Manuka essential oil is used to treat a wide range of complaints. The oil is extracted by steam distillation from the leaves, branches and twigs. Manuka has a spicy, fresh, herbaceous aroma with honey-like aroma. The manuka bush grows in New Zealand and the best of the oil is from plants grown at high altitudes, and this oil is usually more antibacterial than the essential oil from the lower altitudes. There is a close comparison to ti-tree oil, Manuka essential oil is anti-fungal, anti-viral and is also highly bactericidal accross a very wide spectrum. The essential oil of manuka can be used for all respiratory tract infections like: colds, sinusitis, bronchitis, colds, etc. and the oil is also a decongestant. This essential oil can also be used in the bath for colds, or as a gargle for sore throats and can also be dabbed neat onto cold-sores, and can be highly effective. Manuka oil has a delecate aroma that is pleasant, it is often used in vapourisers during an epidemic. The oil can be used on the skin because it is an excellent antiseptic, and it can be applied to cuts, boils, ulcers, spots, etc. For massage, blend with a rich carrier oil like avocado or jojoba oil, for dry skin conditions and sensitive skin. it can be diluted at about 2% as this is a suitable dilution for massage. 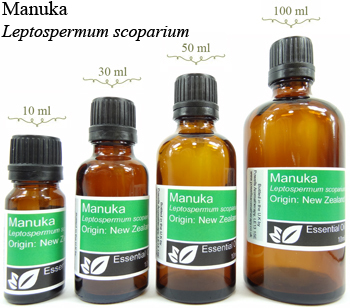 For long term use manuka gives a very good alternative to-tee tree oil as an anti-infectious oil. Blends well with: Manuka oil can be blended with most other oils and because of its delicate scent it can be used when other stronger medicinal oils might not be wanted, blends well with: Clove, cypress, eucalyptus, egyptian geranium, ginger, lavender, rosemary, clove bud, black pepper, bergamot, elemi, vetiver, sandalwood, cinnamon, bay, cajuput, cedarwood and thyme.